Dylan Neuwirth joins Western Neon to create an experimental school for artists. On a hot, smoky day in August, neon artist Kelsey Fernkopf is bending glass. With a gentle, synchronized motion of his hands, he removes a thin hollow rod from between two pointed blue flames and creates a crook—a bend that will eventually be filled with a noble gas and electrified, to become part of a larger creation. Fernkopf is among the top glass benders on the West Coast. He works at Western Neon Custom Signs, a company founded in 1985 by Michael Blazek, son of one of the country’s preeminent neon art pioneers. In Western Neon’s dark, subterranean SoDo studio, Fernkopf chats with me and Dylan Neuwirth as he twists a piece of blue glass into the letter “R,” a form based on my own handwriting. He blows a steady stream of air into a length of rubber tubing attached to one end of the glass rod to prevent the thin walls from collapsing. Neuwirth watches each rotation with awe. He’s worked with Fernkopf on 15 projects over the past eight years, but soon they will take their collaboration to a new level. In January they launch the Western Neon School of Art, a nonprofit educational institution focused on the history, technology, science and crafting techniques of neon. Fernkopf will serve as the school’s technical director and Neuwirth its creative director. Together with Western Neon’s president, André Lucero, they hope to pass on the practical skills needed to create neon works and foster a genuine curiosity for exploration of the medium. Two chemists discovered the element of neon in 1898 and a decade later a French entrepreneur displayed the first neon lamp in Paris. Neon signs arrived in the U.S. in the 1920s, when two orange-and-blue Packard signs appeared in Los Angeles to promote an auto dealership, and went on to light up movie house marquees across America. But after WWII, many neon signs were replaced by cheaper, mass-produced fluorescent-lighted plastic—and the need for bent-glass artisans shrunk. For several decades neon was relegated mostly to beer logos and “OPEN” signs, but in the 1980s the medium experienced a revival—from the dystopian streets of Blade Runner to the dance clubs and music videos of the MTV generation. The vibrant colors and garish glow of neon reflected the contemporary culture of the time—the first edition cover of Jay McInerney’s era-encapsulating 1984 novel Bright Lights, Big City features the fuzzy glare of a neon sign. The constant ebb and flow of neon’s popularity is due in part to the difficult, manual processes it requires. First an artisan has to learn to bend glass—which often takes years of meticulous training. Then, once a tube bender has prepared a section of glass, an electrode is fused onto each end before it goes through a process called bombardment, which involves air evacuation and high-temperature currents, to remove any impurities from the glass, phosphors and electrodes. Once the tube has cooled, the gas is introduced, the tube is sealed and the electrical transformer attached. Despite their name, neon signs are not always made solely with neon; to produce colors other than neon’s natural pinkish-red, other noble gases such as argon, mercury and phosphor are added to the mix. Neuwirth felt the quiet pull of neon from a very young age. The conceptual artist, now 40, grew up in what he calls “the sticks” of Athens, Ga., and had a fascination with a neon sign that hung in the family’s kitchen. Every evening his mother’s name, Judy, glowed red in cursive handwriting with the yank of a metal chain. Neuwirth graduated from the University of Georgia with a BFA in sculpture, then bounced around before landing in Seattle in 2000. In the years since, he has carved out a place in the local art scene, creating a mélange of neon, mixed-media and multimedia art and working for blown-glass icon Dale Chihuly for 10 years. A 2011 show at the now-defunct Punch Gallery included giant collage work featuring parts of model’s faces. The next year, TIME’S ARROW had a blown-glass balloon stuck in the branches of a 10-foot, gold powder-coated steel tree limb, on the floor in an industrial space in SoDo, and last year’s NOT A HOLOGRAM at Glass Box Gallery included virtual-reality elements and live plants. All of these shows used neon—the bold line shot through his oeuvre. “I didn’t want to know exactly how neon worked because I felt like staying away from the technical realm preserved some kind of magic,” Neuwirth says. Neuwirth’s neon works—some text, some geometric shapes—have appeared at Bumbershoot, Out of Sight and Vermillion. 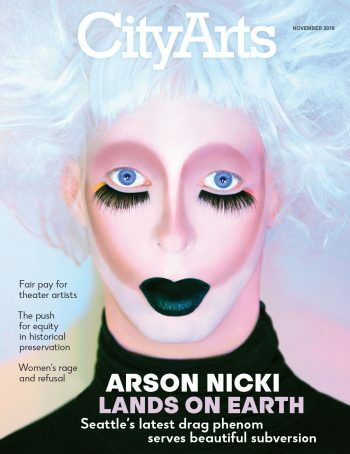 Three years ago, Seattle’s Office of Arts & Culture commissioned JUST BE YOUR SELFIE, an enormous neon piece hung above Occidental Square that became a social media sensation and cemented Neuwirth’s reputation as a neon artist. 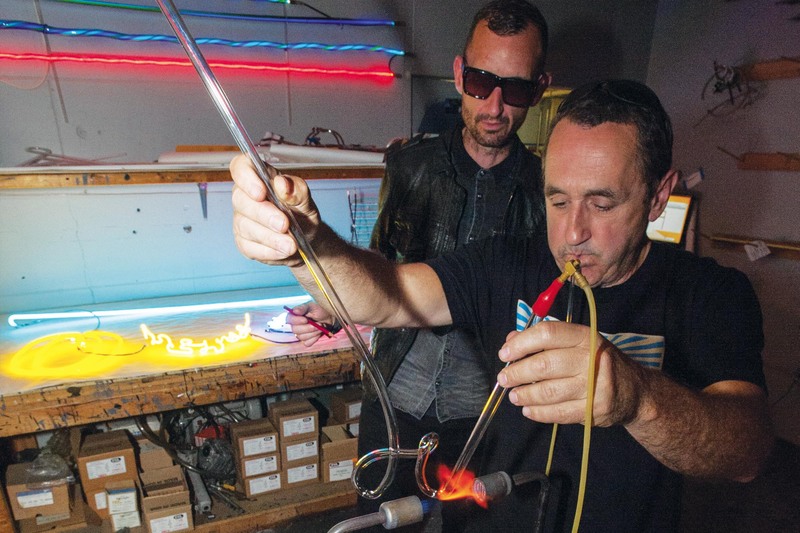 And yet, while he’s designed dozens of pieces of neon art, until recently Neuwirth had never actually bent a glass tube. Instead, all of his pieces were fabricated at Western Neon, often by Fernkopf. “I didn’t want to know exactly how it worked because I felt like staying away from the technical realm preserved some kind of magic,” Neuwirth says. The Western Neon School of Art is an idea that Fernkopf and Lucero have been developing for years. Both men hail from the Midwest and have roots in artistic communities—Fernkopf in neon and Lucero in sign making and installation. Over the past decade they have discussed both the declining interest in skill acquisition in the neon market, and the potential impact on the art world if they passed those skills to a new creative set. The more neon is pushed away from a purely utilitarian medium and into an experimental form, the more likely it is to be considered a serious art form. Lucero discovered Western Neon in 2004, having just arrived from Oklahoma looking for a fresh start. His first job was in the warehouse driving a crane truck, and hard work and dedication eventually took him to the top of the company. In 2012 he moved Western Neon’s operations from a smattering of buildings near 4th and Lander to its current 12,000-square-foot establishment half a block south. He also expanded the company’s production capabilities to include not only bent glass but also steel and vinyl components that allow for larger, more elaborate signs. (The maximum length for a section of sign made from glass tubes is 8–10 feet.) You’d be hard-pressed to drive down a retail-heavy street in Seattle and not see some of Western Neon’s work—signs for Rachel’s Ginger Beer, Tully’s Coffee, Elliott Bay Book Company, the 5th Avenue Theatre and many more. Certainly, if someone wants to learn how to make a beer sign or palm tree they’ll be welcome, but both Lucero and Fernkopf hope to attract out-of-the-box thinkers like Neuwirth who will continue pushing the medium into the fine-arts realm. Programming at the school will include classes for all levels, solo instruction, residencies and more. The medium is making strides, but it’s not just the kitsch factor that’s previously held it outside of fine art circles. His interest in cosmic interconnectedness makes his first bent-glass project a poignant and cathartic choice. Tackling the skill is more than a personal milestone; it’s something he feels he owes both his art and his future students.